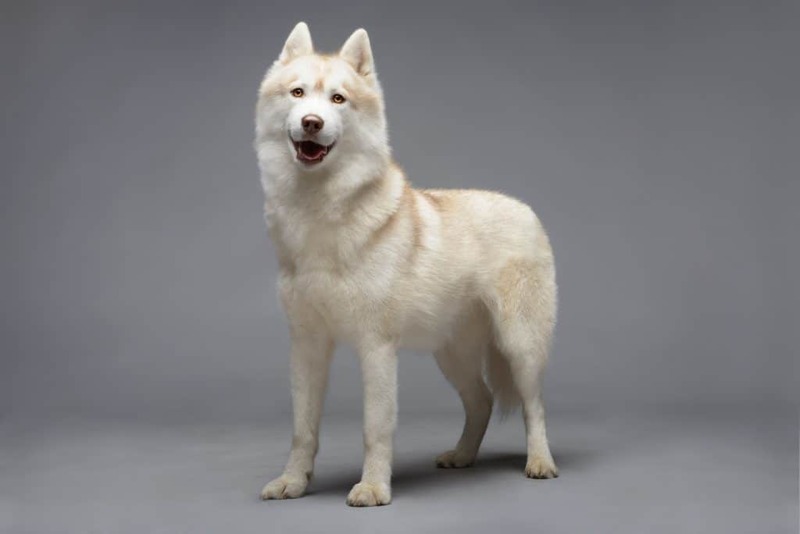 You are here: Home / Breeds / 6 Questions About The White Husky Answered! The White Husky is perhaps one of the most impressive canines to behold. His beauty, strength, and stamina make him stand out as a sought-after canine companion the world over. An exceptional dog for the active family, the Husky is known for his caring and playful nature with children. The White color variant isn’t one that you see in every backyard, but why is this? Let’s take a look! 1. Is It The Same Breed as The Siberian Husky? 3. Are The White Husky Puppies Born White? 4. What Makes Husky Become White? So I Can’t Guess Accurately Just From Looking at His Parents? It Can’t Be That Hard To Work Out Though! Does My Dog Have the White Gene? 5. Do They Have a Friendly Temperament? 6. How Do I Know If I’m Ready to Welcome My Husky Home? The White Husky is a rare color of the dog breed, Siberian Husky. Not to be confused with the Alaskan Husky who is considered an unofficial Husky strain that does not hold registration with the American Kennel Club. The White Huskies appearance varies from that of the light gray, or isabella white. Spotting the real deal is, in fact, incredibly simple to do, and does not require canine expertise. A true White Husky will be entirely white in coat color, he ordinarily will display black pigmentation of the nose, gums, and around his eyes – however, these can appear faded in a phenomenon known as “winter nose.” This is akin to us losing our tan over the winter! 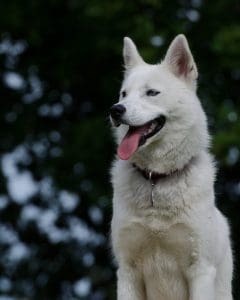 An Isabella White Husky will never possess any black pigmentation; instead, it’s common to see their nose, gums, and eyelids in a light brown or liver color. White Husky puppies are born entirely white. Some Husky puppies may appear almost white at birth save from a few patches of cream or grey, but this usually indicates that the dog will grow up to be Cream or Isabella White and not pure white. The real test is whether the puppy’s nose is black. As we mentioned earlier, only a pure white Husky can have a black nose. Knowing the dog’s family history will help too, but even then – experienced breeders will only be able to determine with a 25% certainty what colors will appear in their upcoming litter. Coat color comes from your dog’s genetic makeup, but unlike eye color or hair color in humans which we can guess reasonably accurately, with dogs, it’s more of a guessing game. Your puppy’s parents and grandparents play a role in determining what color your future pup will be, but it’s not guaranteed. Imagine if you and your sister were throwing in name ideas into a hat, and for every name that one of you threw in – the hat got to randomly throw in one or two suggestions. Well, simply put, that’s how color selection works! 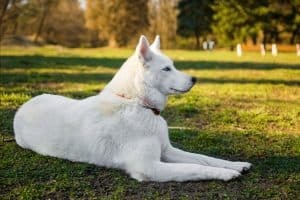 There is a lot of information on the technicalities of genetics and how that affects coloration, it’s an interesting read but not necessary to be able to find your very own White Husky! Your pooches parents have a bunch of different colors through their ancestry, so just because they’re white, it doesn’t mean that they can’t pass on the color of a grandparent who happened to be red! The colors passed on won’t always be the same, meaning that if you breed the same dogs again – you won’t be able to know what color the puppies will be. Instead, each egg cells and sperm cell can possess different building blocks for color – but each sperm or egg cell can only have one. Therefore you’ll often see litters of puppies sometimes all being born different colors. 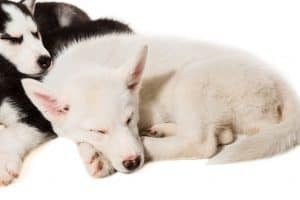 However, some genomes are dominant, and therefore we do know with some level of certainty that if you were to breed two dark Huskies together – you’re highly unlikely to welcome a white puppy into your home. Sure, with only thirty-nine chromosomes, you’d be forgiven for assuming that it would be easy to look through and figure out which color your future puppy will be. But while thirty-nine doesn’t sound like too many, remember, that’s in every single cell that makes up every single puppy. When looking at the DNA of your pooch in general, If we had to look at his entire genome – that’s 2.8 billion base pairs of DNA! Best leave it to the expert breeders to figure out how to get you that White Husky you’ve been dreaming of, right?! You may be surprised to hear that two pigments ultimately determine the coat color of your future dog, and neither is white. These pigments, which are both forms of melanin, are Pheomelanin (red) and Eumelanin (black). You may be wondering how there is such an abundance of color choice in dogs if only two color pigments exist. Well, it’s pretty simple; specific genes either enhance or block these pigments from developing. For example, a pure white husky is a result of particular genes preventing the pigment to all hair. But it’s not just coat color that these two pigments work on, in fact, a presence of eumelanin is responsible for giving your dog his black nose. But, a lack thereof causes your Huskies eyes to be blue. It may sound confusing that he can have pigment in some areas but not in others, but just as some kids from the same family can be born with brown hair and brown eyes, it’s not unheard of for one out of the bunch to be blonde and blue eyed! So it should be no surprise that puppies from the same litter can appear to be unique from their siblings. Now that you understand what determines the coat color of your future husky, it’s time to get to know the breed! A large breed, the Husky, is the perfect cold weather canine. With a coat unlike any other, they can not only survive, but thrive in inhospitable climates such as Siberia, Alaska, and the Arctic. When working, the Husky is focused on his job and is very much part of his pack. He is not to be petted and played with. However, when brought up in a family environment; the Husky makes an exceptional, and loving companion. The Siberian Husky is an incredible canine, famed for his prowess as a sled-dog. While many famous explorers enjoy the spoils of success for having conquered treacherous terrains – their dogs, who made the journey possible – are left out of the history books. Huskies have been around since the Chukchi people of Eastern Siberia began breeding them. This resilient dog breed was ideal to help them with herding, and hunting. The nomadic hunter-gatherers often hunted large animals, the majority of this focused on Reindeer, but they have been known to go after Marine Mammals and even Polar bears. As this population of indigenous people moved constantly, they traveled with not only all of their possessions but the masses of hides and poles that made up their famous tent homes. Because of this, they relied on their huskies to help pull the sleds holding these disassembled houses. A Russian fur trader by the name of William Goosak is believed to be the first to take these dogs to new parts of the world. Upon hearing about the gold rush in Nome, Alaska; Goosak bought a team of sled-dogs from the Chukchi people and headed to where the money was. The locals initially made fun of the Siberian Huskies, nicknaming them rats due to their small stature of 35 lbs when compared to their own Alaskan Malamutes weighing in at a whopping 70 lbs. Soon, the locals were eating their words, after seeing the world’s greatest sled dog in action. It is the Huskies size that allows him to be more nimble, and have better endurance than their native sled-dog. It was here in Nome, Alaska that we believe sled-dog racing as a sport first began. With many gold hunters all boasting that their dogs were the best, some confident fellows finally put it to the test – and sled-dog racing was born – and is still going strong today! While color doesn’t help with speed, the white, or the Albino Husky sure runs with style, blending into their surroundings like no other. Many owners joke that they would prefer not to have a White Husky lest they lose them in the snow! All responsible dog owners have to make some important decisions on whether they will be the right owners for their preferred breed before welcoming them home. If you had your heart set on a Great Dane but lived in a tiny house, and were out at work all day – you know that you have to adjust your expectations based on what will be best for your new fluffy member of the family. All too often, we see Huskies being bought by responsible, caring, and loving owners – but, they forgot to consider one little thing. The weather! 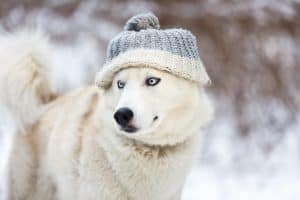 Huskies are cold weather dogs, their coat is designed specifically to insulate them, and while it can do a good job of keeping them cool, living in tropical or incredibly hot climates is just not fair on them. The Huskies coat is also very delicate and should never be clipped, so if you do happen to live somewhere a little warmer than your dream dog would like – we have the perfect solution! Here is our pick for an alternative dog breed that shares many traits with the Husky, but, he can live comfortably in hot weather! With a similar aesthetic to the Siberian Husky, the Australian Cattle Dog possesses alert ears, a smiling mouth, and a medium-shedding coat just like his winter-ready distant relative! Cattle Dogs pull ahead as the winner for hotter climes due to their medium length coats which allow them to not only survive but thrive in treacherous lands such as the Australian Outback where they were originally bred to drive cattle. Famed for their intelligence, this working dog, even though he’s not the best pooch to pull a sled – loves having something to do. Just like the Husky, he thrives in a family environment, and while he is often shy among strangers, he is loving, playful, and protective of his family. With many coat colors to choose from, it is possible to find a white, dappled white, or patchy white Australian Cattle Dog to welcome into your family! Huskies are a fantastic breed, and there is no doubting that the pure white versions are incredibly impressive to look at. It can be a hard and long task to find a pure white husky puppy, but if you have your heart set on a white husky, why not consider buying or adopting an older dog?